The Zarafshan is one of the great rivers of Central Asia. Its name translates as "The Strewer of Gold", and the name under which it was known to the Ancient Greeks - the Polytimetus, or "Abundant in Wealth" - reflects its nature throughout history. It has been the nourisher of the great cities of Samarqand and Bukhara, and the civilisations centred there. These cities and those all along the river have always relied on the arriqs (irrigation canals) to enable the production of a rich variety of crops. The regular flooding in the lower reaches provided the silt to form large areas of fertile fields. It has also been a gold bearing river - hence the name - and this has added to its economic importance. It flows in a remarkably straight line from its headwaters fed by the glaciers of both the Zarafshan and Turkestan ranges. Joined by numerous other tributaries, it flows to Bukhara and though it once joined the Oxus (Amu Darya), now it drains away into the deserts. The Zarafshan River at the bottom of the valley that bears its name irrigates an emerald-green strip of land, the vibrant colour of which stands in stark contrast to the crumbling, brownish-grey scree of the steep mountain slopes either side. Along with the parallel Yagnob Valley, the 200km (125-mile) Zarafshan Valley is a popular area for trekking, and within easy reach of Dushanbe, Khujand and Penjikent. The major appeal of the Zarafshan Valley is its magnificent landscape: deep gorges and cliffs, the Zarafshan River itself, groves of fruit and nut trees, and ribbons of irrigated land. The valley has a number of fortifications; its inhabitants have constantly warred with one another or needed to see off invaders. The ruined tower of Hazrati Burq in Rarz dates from the 10th century and was once part of a far largely military complext. In Ob Burdon, immediately before the turn-off to the Ob Burdon Pass, is another fortress, built by the local bek in the 18th century. This site has been partially restored and is surrounded by pleasant orchards. To the south side of the valley are several impressive peaks including Samarkand Peak (5,086m) and Sery Utes (4,434m), and potential routes for mountaineers are numerous. It is also possible to continue east to the Zarafshan Glacier, though you require permission from the military commander in Dehisar to do so. The Tajik government has begun to charge climbers who wish to ascend peaks over 4,000m. Permits cost US$50 for peaks of 4,000-7,000m, and US$100 for those over 7,000m. The Zarafshan Valley was the site of the Sogdians' final retreat from Penjikent, and there are remains of their fortresses at Kum, Mount Mugh and Madm. Though the fortresses are in ruins, with often little more to see than the remains of mud-brick walls, locals can regale you with tales of battles against the Arabs, and will happily do so over tea. You will need a basic understanding of Tajik, or a guide who can translate. Leaving the main road at Gussar and driving 10km south brings you to the mausoleum of Khoja Muhammad Majorah in the village of Mazori Sharif. Majorah was an Iraq-born missionary who came to Tajikistan in the 8th century, and pilgrims still come to pray at his shrine. The structure itself is contemporary with his death (8th-9th century), features incredibly fine wood carving including an elaborate mihrab, and is topped with an attractive tiled dome. 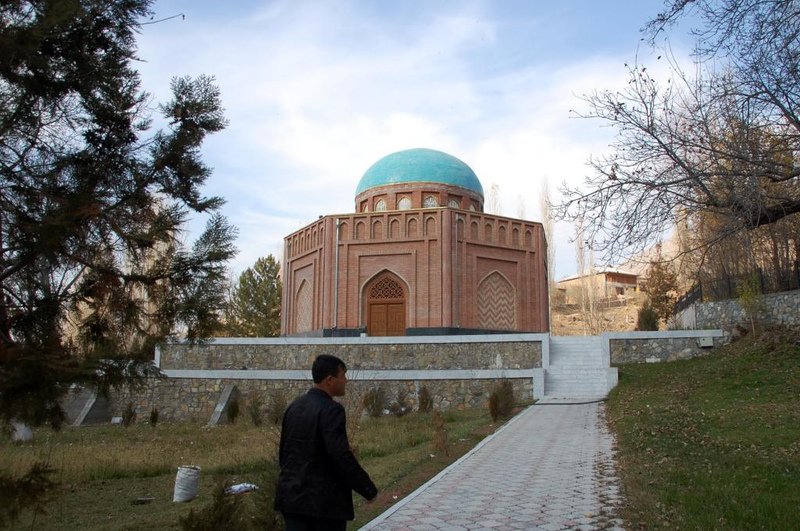 Rudaki, the so-called father of Tajik literature is purportedly buried in Panjrud. His mausoleum, which dates from 1956, is within a peaceful, well-maintained garden, and there is also a small museum. Fan mountains, a range of peaks higher than the Alps, offering anything from gentle walks, treks to full on alpine climbing. Seven Lakes: set in the western Fan, a group of seven attractive lakes, each with very different features, linked by a good road. Iskandar Kul: a large, beautiful mountain fringed lake, redolent with legends of Alexander. Penjikent: the 'Pompeii of Central Asia'. Excavations continue at this important Sogdian fortress. An excellent museum in the new town houses some of the remarkable frescoes from before the eighth century. Yagnob valley, a remote and wild place, home to people who still speak an ancient language, spoken in the time of Alexander. Barren khaki walls and splashes of intense irrigated green characterise the wide Zerafshan Valley to the north. The most promising destination here is the traditional village of Veshab, 47km from Ayni. There’s good hiking behind the village to the summer pastures at Tagob (two hours), or try the steep two- to three-day trek to Hshirtob in the Yagnob Valley (via Darg). The mosque and tomb of Shams-i Tabrizi below the village are also worth a visit. There are more trekking opportunities further up the valley, around Langar and Past-i-Gov in the wild region of Gorno Matcha. Many tourists have combined a visit to the Zarafshan, usually to Penjikent and a trek in the Fan mountains, with visits to the cities of Bukhara and Samarqand, with their architectural wonders, in Uzbekistan. However, relations between Uzbekistan and Tajikistan are not always cordial, and the crossing between the two countries, just to the west of Penjikent, might be closed. So check before you travel. Getting there The entrance to the eastern part of the valley is immediately to the south of Aini, and this is the best place to organise intercity transport to or from. From Aini there are shared taxis to Veshab, about a quarter of the way along the valley's length. The journey takes an hour and costs TJS30. There is a rough road past Veshab to the head of the valley and, though it is passable in most vehicles, it is infinitely more comfortable in a 4x4. There are no minibuses in this end of the valley but most motorists are happy to pick up additional passengers providing they have room. Allow two full days to drive the full length of the valley. Minibuses between Aini and Penjikent drive the length of the valley in four to five hours, and connect with buses travelling onward to Khujand and Dushanbe. The road quality is poor throughout, with the exception of the final stretch into Penjikent when you may be able to accelerate to 60km/h or so. Travelling off the main road generally requires you to have your own 4x4 t ransport or to hitch a ride with a passing vehicle. The notable exception is Panjrud, the location of Rudaki's mausoleum, which can reached by minibus from Penjikent (TJS5), and en route to Panjrud and Shing. The roads are unmade and consequently exceptionally bumpy.